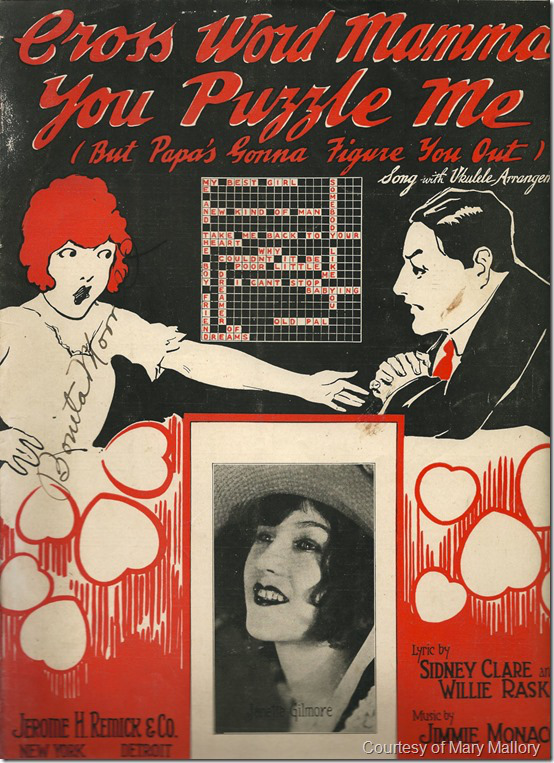 Although the crossword as we know it celebrates its birthday on December 21, tracing its roots all the way back to 1913, it was the 1920s where crosswords really caught the public eye. By 1924, crosswords had officially become a fad, inspiring fashion trends (black and white patterns) and moral panics alike. But it was also the year of the novelty crossword song. Yes, crosswords found their way into the world of music, serving as inspiration for numerous comedic ballads. The subject of the song is an ardent puzzle solver, but the singer of the song is more bothered by the fact that he doesn’t have her full attention, painting her as someone who ignores him or flirts with other guys. He is clearly suspicious of her, and expresses his suspicions through crossword clue references. But Papa’s gonna figure you out. You call me honey – that means bee! Looks like I’ll get stung no doubt. You better get your answers right. I heard you mention “butcher” – that means “meat”! Who you gonna “meet” tonight? The singer is clearly confused by both crosswords and the object of his affections. It would be best if he just left them both alone for a while. Given how difficult some people find crosswords, you shouldn’t be surprised that there was a blues song penned about crosswords the same year. 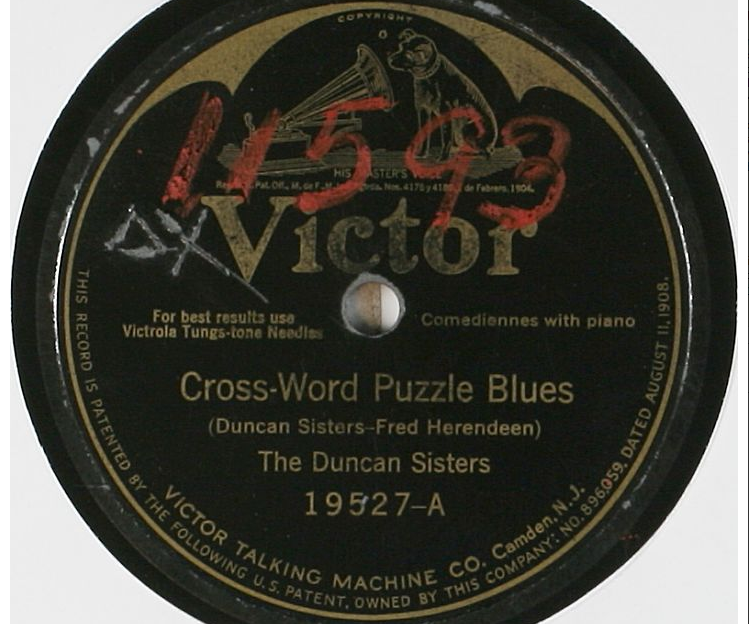 “Cross-Word Puzzle Blues,” penned by Fred Herendeen and performed by The Duncan Sisters, is surprisingly upbeat, as the sisters describe themselves as “criss-cross crazy” and discuss their difficulties solving puzzles. It’s very silly indeed. There’s a strange recurring theme with these songs where women are primarily the solvers, and the men in their lives are utterly baffled by the pastime. 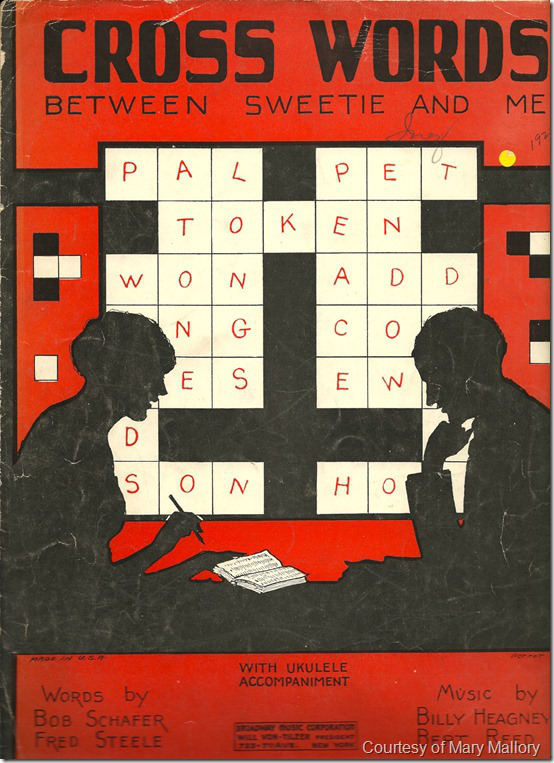 In a similar vein to the first song, “Cross-Words (Between Sweetie and Me)” is all about a man who feels spurned and underappreciated by his crossword-obsessed lady. I’m jealous. How can I win sympathy? I’m hoping she’ll soon need L-O-V-E. He goes on to describe how a group of people solving crosswords were so quiet, he thought they had died, and he subsequently broke into the house to make sure they were all right. Billy clearly has boundary issues, and although his sweetie might be spending too much time with crosswords, at least they’re keeping her away from her weird, weird paramour. This is just a sampling from a single crossword-obsessed year. I’m sure there are many more puzzle-inspired songs out there. Do you know any? Let us know in the comments section below! We’d love to hear from you!